Chroma's 63200 series electronic loads provide constant current, constant resistance, constant voltage and constant power modes. The CC and CR mode load simulation is helpful to test whether the output voltage of the UUT remains stable, or regulated under different load conditions. For battery chargers, CV mode can change the output voltage to test if the battery charger is providing the correct charging current corresponding to the battery voltage. If the UUT is a battery, the electronic load is able to simulate the behavior of the device that uses the battery. For many battery discharge applications, power consumption patterns need to be analyzed. The constant power, or CP mode, is ideal for these applications. For low voltage/high current applications, the 63200 series is available with a low voltage mode, which provides ultra-low voltage operation and in many cases can compensate for large voltage loss in the input wiring. The 63200 series loads use a current closed loop design connecting all power MOSFET devices in parallel, to insure high accuracy load control with minimal drift (less than 0.15% of the current setting). The MOSFET technology keeps the input impedance to a minimum and enables the load to draw very high current even at very low voltages. For example, the model 63209 is capable of drawing 1,000A at only 1V input. The Chroma 63200 series loads have a built-in 15-bit precision A/D converter that can achieve 0.05%+0.05% F.S., 0.1%+0.1% F.S. and 0.3%+0.3% F.S. accuracy for voltage, current, and power measurements respectively. These measurements can be displayed simultaneously on three big LED readouts for convenience. In addition to standard measurements, the 63200 series also provides voltage and current monitor outputs, which are useful when the user needs to monitor the voltage and current waveform via a scope. Modern electronic devices operate at very high speeds; therefore, it is important for an electronic load to perform well during the transient and dynamic testing. To satisfy these testing applications, the 63200 loads offer outstanding high speed, programmable dynamic load simulation and control capabilities. The figure below shows the programmable parameters of the 63200 load modules. The programmable slew rate makes the simulation of transient load changes demanded by the requirement of real life application possible. The internal waveform generator of the 63200 is capable of producing a maximum slew rate of 25A/μs (63208), and dynamic cycling up to 20kHz. Its dedicated remote load sense and control circuitry guarantee the minimum waveform distortion during continuous load changes. When higher power is required, it is common to parallel two electronic loads together to draw higher current. The 63200 series high power loads have a smart Master/Slave control mode. When the loads are set to Master/Slave mode, users can program the loading (CC mode only) on the master unit. The loading current values of the slave unit(s) will be calculated and downloaded by the master unit automatically. In short, unlike traditional designs, users now have the option of operating several loads in Master/Slave mode as a single load unit. The 63200 series electronic loads can be controlled by an external analog control signal, which is generated by any kind of signal or an arbitrary waveform generator. This makes it capable of simulating any loading waveform observed in the field within the load specifications. Chroma's 63200 series electronic loads can also simulate a short circuit condition. The load can short a DC power source or any power supply that has a built in current limit function and measure its short circuit current so that users can verify if the UUT current limit is functional. 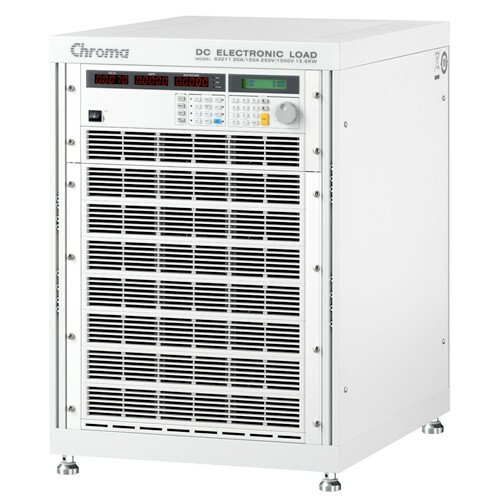 Chroma's 63200 Series DC Loads provide a unique surge load simulation capability which allows users to overdrive the loads up to 2.7 times their rated power for short periods. This feature is ideal when the average power required by the UUT is low compared to short-term peak power demands. Plasma Display Panel (PDP) testing is one typical applications, others include battery 3C discharge, breaker & fuse over rating (300% to 1000%) tests, car engine startup simulation and DC motor startup simulation. The amount of surge loading available using the 63200 loads is related to initial loading conditions. Figures 1 and 2 show the relationship of the initial state (Load_Low under Dynamic mode) and the maximum acceptable overdrive power. Under this operation, the load will display an Over Power Protection Alarm (OPP) and will disable the load current if the user violates the maximum surge load capability showed in the figures. Note 1 : The Initial state under Static Mode should last at least 1 second. Note 4 : Model 63211/63212 does not support this feature. The 63200 loads include a unique timing and measurement function. This allows for precision time settings and measurements in the range of 1s to 99,999s. This feature also allows users to set a final cutoff voltage and timeout value for battery discharge testing and similar applications. For example, the figure to the right shows that the 63200's internal timer can be initiated automatically when starting load on. The timer will stop counting until the cutoff voltage value is reached, or timeout occurs. Power supplies play a critical role in electrical and electronic devices. They have diversified into several different configurations for various applications. For example, AC/AC power supplies are used for UPS and AVR, AC/DC power supplies are used for server power supplies, and DC/AC power supplies are used for inverters that transfer battery power to AC for home appliances. Lastly, DC/DC converters are widely used in battery powered devices such as cellular phones and laptop computers. With four different load modes, Chroma 63200 series electronic loads are capable of testing many different DC output power supplies either directly or via a rectifier. They can also be used to test AC output power supplies. Almost all modern electronic equipment have a built in power supply. Therefore, a DC electronic load is an important instrument for these devices during the R/D and Q/A phases. For example, A/D, D/D and D/A stages are normally integrated within a UPS. 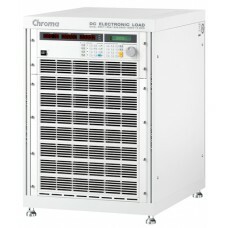 The Chroma 63200 electronic loads are helpful in testing the internal A/D and D/D boards of UPS devices. For most applications, power consumption patterns are based on constant power. Therefore, the CP mode of the 63200 series electronic load is ideal to use as a discharge load for battery testing. Chroma 63200 series electronic loads provide GPIB, RS-232 and RS-485 PC controllable interfaces. These features combined with the external waveform simulation and voltage / current monitoring capability make Chroma 63200 series ideal for automatic system integration. The 63200 series can be operated from the front panel or controlled by softpanel software. The user friendly software includes all the functions of 63200 series, and is easy to understand and operate. The 63200 series can be configured with either GPIB or RS-232 interfaces as an option for remote control and automated testing applications.